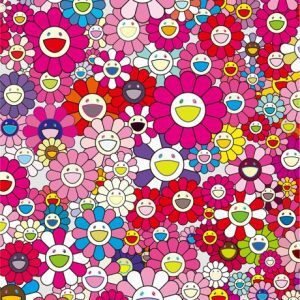 Takashi Murakami (Japanese, b. 1962) is internationally renowned for his playful negotiation of several styles and traditions. Combining the 19th-century Japanese painting style known as Nihonga–itself a mixture of Eastern and Western styles–with contemporary manga, anime, Japanese pop culture, as well as so-called “fine art,” Murakami’s work is as prolific as it is rooted in a mixtures of places and times. 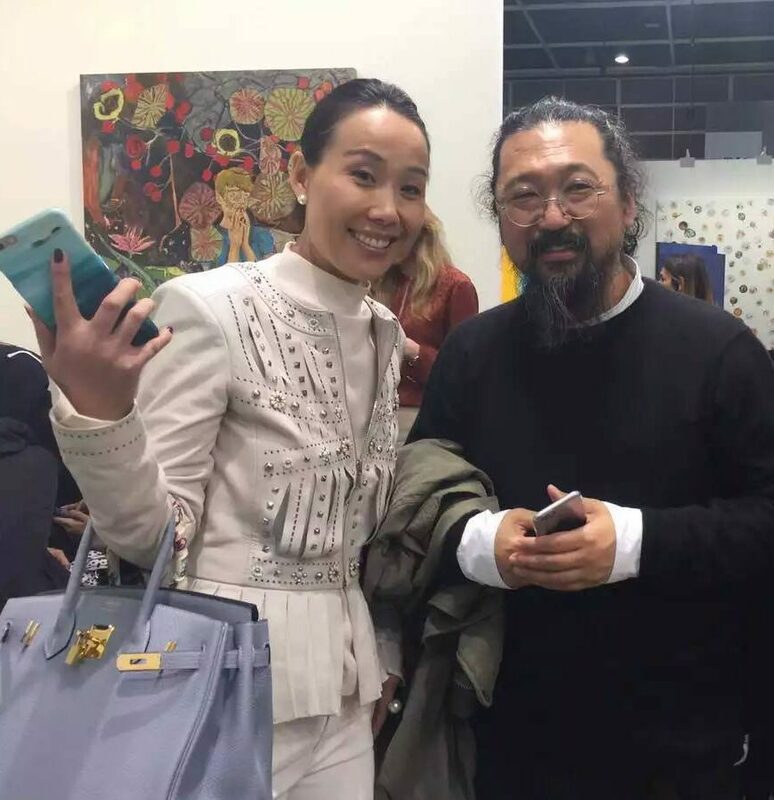 YANG GALLERY Singapore & Beijing 798 Managing Director Ms. Susanna Yang with established artist Takashi Murakami. 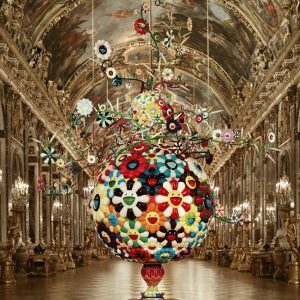 Coining the term “Superflat” to describe his and other contemporary Japanese art, Murakami’s unabashed glossy superficialism is not to be taken, ironically, at face value. Underpinned by a sharp wit and a keen awareness of how contemporary visual culture operates, his works’ shiny attractiveness engages in a visual commentary on different histories of art and the nature of contemporary consumer practices. 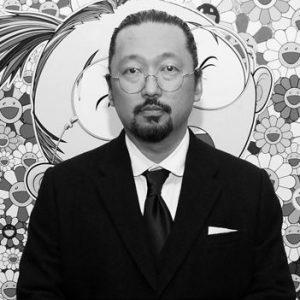 Murakami is the founder and President of the art management corporation, Kaikai Kiki Co., Ltd. He received his BFA, MFA, and PhD from the Tokyo University of the Arts (formerly the Tokyo National University of Fine Arts and Music). Takashi Murakami has gripped the imagination of collectors and curators around the world with his anime-inspired Superflat art, a movement created by the artist that refers to the flattened aesthetic of Japanese graphic art forms, from traditional ukiyo-e woodblock prints to contemporary animation, as well as to the shallowness of contemporary consumer culture. 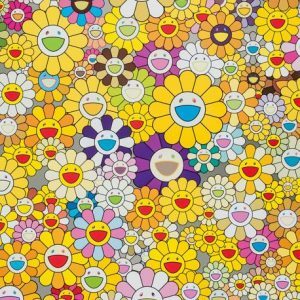 Perhaps Murakami’s most emblematic motif, these candy-colored, smiling flora came into the artist’s work when he was preparing for his entrance exams for the Tokyo National University of Fine Arts, and he embraced the form over nine years teaching prep-school students to draw flowers (even though, as he once said, “I didn’t like flowers”). Murakami’s recurring characters each represent a different part of his psyche and were originally created as a statement that Japanese art doesn’t need to imitate American art, and should find its own means of expression. 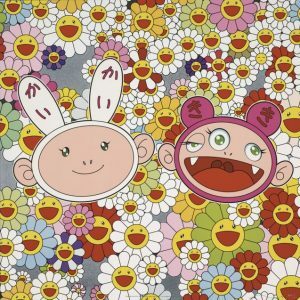 In 2002, Murakami was invited to collaborate with fashion house Louis Vuitton on a series of accessories, for which he reinvented their signature monogram in a variety of candy-colored hues. Murakami later re-appropriated the monogram into his own work, further blurring the boundaries between high art and popular culture.